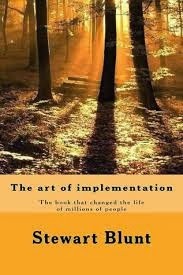 If you have ever felt as though you wanted to change something about your life or situation, then "The Art of Implementation" is for you. This book covers various topics regarding changing yourself into who you want to be. One of the main focuses of the book is how to overcome failure and turn it into something positive. I'm someone who generally considers himself optimistic, but the author's view on using failure as a chance for achieving the positive is something that never occurred to me. I've been implementing it into my own life over the past few days and am surprised at how well I have reacted to it. This book also covers the tricky concept of motivation, which is necessary to understand if you truly want to change yourself. One of my favorite things about the book is that it is written in a conversational style. The author shares lots of personal anecdotes, as well as quotes and stories from famous people. I particularly liked a section about Albert Einstein's philosophy regarding success (which is incredibly inspiring). Overall, I would definitely recommend this book. It's chock-full of information on becoming the person you want to be and written in a way that is easy to follow.